Home Services Travel and Tours 4D3N Bangkok Thailand Promo Package with Airfare! 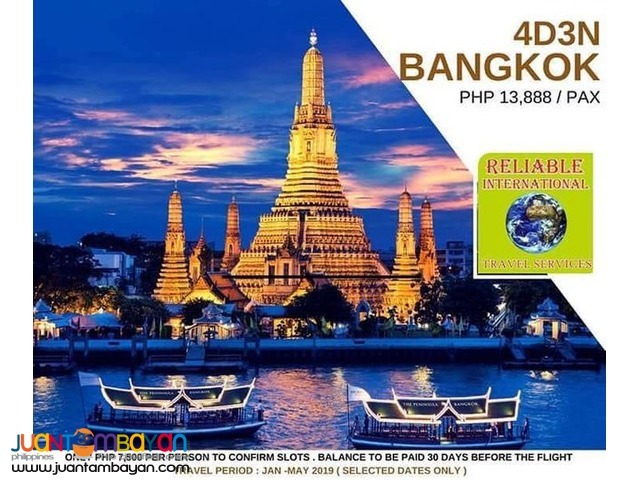 4D3N Bangkok Thailand Promo Package with Airfare! **Only PHP 7,500 per person to confirm slots. Balance to be paid 30days before the flight. DAY 1: Arrived Bangkok. Meet and transfer to Hotel for overnight stay. DAY 2: After breakfast proceed for CITY AND TEMPLE TOUR to visit Wat Indrawihan ( Standing Buddha). Continue tour and take a boat across the Chao Phraya River and visit Wat Arun (Temple of Dawn). Then continue to visit Gem Stone Factory, Leather Factory, and Honey bee Shop. After transfer back to hotel. DAY 4: Breakfast. Free time until pick up for return airport transfers. •Hotel incidental Deposit of 1000BAHT PER ROOM – Refundable upon check out.